Despite having reportedly obtained all necessary prior permissions, Syrian government forces turned away an international aid convoy attempting to bring much-needed relief supplies to the besieged Damascus suburb Daraya on Thursday. 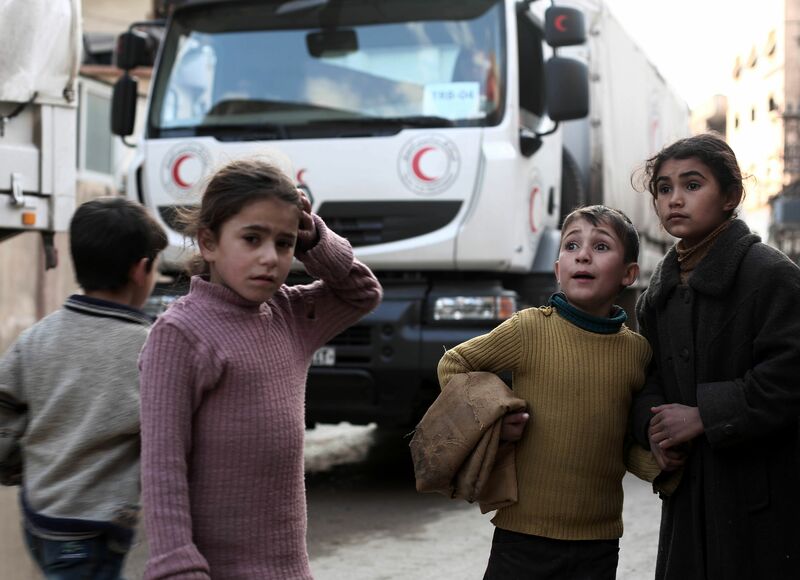 It would have been the first humanitarian aid to reach besieged residents in the rebel-held town since 2012, the International Committee of the Red Cross (ICRC) said. The seemingly last-minute decision to block the joint ICRC, Syrian Arab Red Crescent (SARC), and United Nations convoy from Daraya has left many questioning why Syria's government is refusing international demands to deliver aid to citizens trapped in towns under siege as fighting rages on in the country's civil war. The convoy, which was made up of five trucks carrying medical supplies, children's' vaccines, baby milk, and hygiene supplies waited for hours outside Daraya as U.N. officials attempted to negotiate entry with officers at the final government checkpoint, according to a joint statement issued Thursday by the ICRC and the U.N. in Syria. Eventually, the joint aid convoy was refused entry and forced to turn back, "despite having obtained prior clearance by all parties that it could proceed," the statement said. "Daraya has been the site of relentless fighting for more than three and a half years," U.N. Resident and Humanitarian Coordinator in Syria Yacoub El Hillo said. "We know the situation there is desperate. We were hoping that today's delivery of life-saving assistance would have been a first step and lead to more aid being allowed in." But that long-awaited aid never arrived for Daraya's desperate residents. Instead, in a development that further frustrated international humanitarian efforts, shelling of the rebel-held town resumed. Shortly after the IRCR convoy was denied entry, two people were reportedly killed when Syrian President Bashar al-Assad's government forces shelled a group of civilians awaiting the aid trucks inside Daraya, according to the independent monitor Siege Watch. Former U.N. Undersecretary-General for Humanitarian Affairs and Emergency Relief Coordinator Jan Egeland claimed it was the baby milk that caused the aid convoy to be refused entry to Daraya in a tweet posted to his official Twitter on Thursday. "[How] low can men with arms sink? Today Syrian Army blocked humanitarian mission to starving Daraya becuse [sic] it carried baby milk!" the former U.N. diplomat tweeted. The Council of Daraya City had previously warned residents the limited aid convoy would not contain food supplies in a post on Facebook. They claimed officers at the final government checkpoint had wanted to confiscate the baby milk and medical supplies from the convoy. It is likely that Syria's government forces object more to the idea of international aid reaching areas held by armed opposition forces than to a few boxes of baby milk. But with hundreds of thousands of Syrians under siege in the war-torn country (the U.N. estimate claims it's more than 486,000 people, while estimates from Siege Watch and Doctors Without Borders say 1 million and 2 million, respectively), the need for aid is unparalleled and international humanitarian law must take precedent. Thankfully the IRCR and the U.N. seem determined to continue an aggressive push for aid access. "Communities in Daraya are in need of everything, and it's tragic that even the basics we were bringing today are being delayed unnecessarily," Head of the ICRC in Syria Marianne Gasser said. "We must be able to provide aid impartially and safely. There must be minimum conditions for independent humanitarian action in Syria. Today those conditions were not met. We urge the responsible parties to grant us this access immediately."